I can’t believe I haven’t posted since Wednesday. I’ve never gone so long without posting. Last week, I worked 11 and 12 hours every day all last week and weekend. There were three other radio stations on a tower right outside out studios. It was causing all kinds of interference and problems. Last week and last weekend myself and two other engineers I moved all three to the room and tower where my two transmitters are. It was a really big job. The OI Girl is very unhappy. She says I work too much and am being taken advantage of. I’m at work, I’ve been super busy, Three other radio stations are moving to the same tower where my two are. I am running on a backup transmitter while we replace one of my two antennas with a boradband antenna. It’s Tuesday, I’ve been super-busy already today. It is the start of a busy week. I have a lot going on, Outside Broadcasts, and another radio station are moving their three transmitters into my transmitter room. Plus I want to maintain my afternoon swims with the OI Girl. I’m at the Cayman Brac airport, getting ready to go back home. the OI girl’s staying till tomorrow. We had a great swim, both of us. The OI girl came in 18th overall (out of 60 swimmers) and was first in her age category (out of two). That’s it for now! tomorrow is work! Last night was the Astronomical Society Meeting. It was just OK. It didn’t seem too dark. This afternoon The OI Girl and I are going to go to Cayman Brac for the Sea Swim Saturday. (tomorrow). I’m coming back Sunday and she’s coming back Monday, because she doesn’t have to work. Yesterday, we stopped and swam the half mile. I was so tired that it was a chore walking back down the beach to the car. When I got home, the OI girl made tomato soup and I made grilled cheese sandwiches. Then I passed out. I laid down and I don’t remember a thing till the alarm went off this morning. Yesterday, during the swim the water was rough. We almost didn’t swim at all, but it’s been rougher and yesterday was calmest it’s been for a week or so. Also, new thing: it’s a website called Calorie Count. You go and set up an account, then you log what you eat and what exercise you do. It’s pretty cool, it takes a while to get set up, but then you can do it pretty fast, once you learn your way around and get your main items tagged so you can find them quickly. The OI Girl is so far mostly taking care of mine. My calorie intake should be 2400 a day and yesterday mine was 2340. Pretty good! I weigh 190 (about) and am 6’1″ tall. If I was an inch taller I wouldn’t be over weight, maybe if I ate more, I’d grow another inch! I thought I posted yesterday. . . Guess not. In my studies, I have 16 lessons left. That is an accurate count, I just checked. It seems I was stuck in the 20’s for a long time. I really want to get done. I can tell, a little, that my study habits have improved since I started the course. I actually enjoy getting up early, studying and seeing the sky turn light. 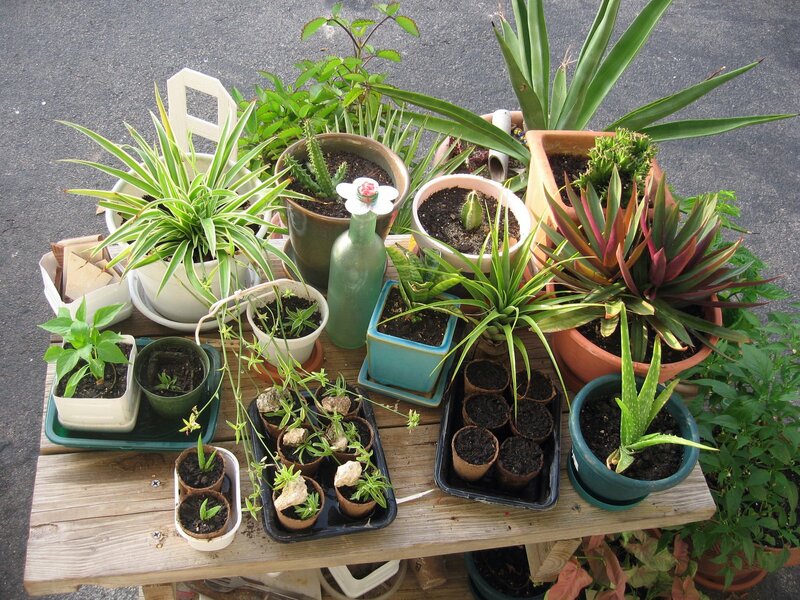 This is a picture of my “table garden” in the front of my apartment. I am growning peppers, and I’m trying to make some spider plant babies. I’ve done it before, so I’m sure it will work. I’ll be glad when I have a yard and can grow some big stuff, like mango trees.